Normally it would bother me that the hero and heroine are only together in dreams, but in this book it didn't bother me at all. I think most of that was because I found that Zoe's job as a whale biologist intrigued me. I loved the scenes when her organization battled another one, and learning about what they were doing. I felt like I was on the boat with Zoe working with the whales. I liked how Zoe knew what she wanted-the Vice Presidency of her non profit and wasn't afraid to say it or do what it took to get it. I loved that she wasn't meek and mild and wouldn't let anything stand in her way of what she wanted. The scenes with Gavin and his band were equally entertaining. I liked seeing him struggle between his work in the band and that as a sentinel. Zoe and Gavin were the heart of the story, but I have to admit that I fell for the bad guy of the story Sinnder. He wasn't in very many scenes, but he stole the ones he was in. I can tell that deep down he's really a good guy just working with the wrong crowd. The wrong crowd being Scarlet, who was well, just plain bitchy, lol. Scarlet tried her hardest to take over not only her group of elementals, but the world of the Dremensense and wanted Gavin for her own. I loved how everything kept backfiring on her. Have I mentioned how wonderfully bitchy she was? While there was a lot of set up for the next two books in the series, I never felt like the story being told got lost. 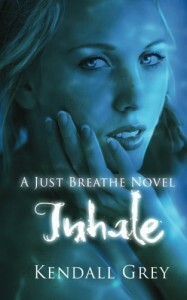 Inhale is a great read just because of the unique setting of the story. This was a great debut novel, and I really can't wait to read the next two books.